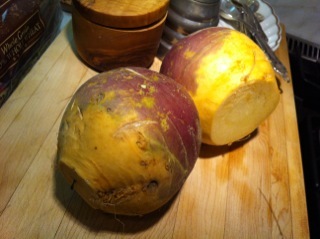 Rutabagas are sometimes called “Swedes” because they are the Swedish cousins of turnips. This fact has always sparked my interest because I, too, have a Swedish cousin, although her name is Sarah, not Rutabaga. I think of her every time I eat one of these friendly root vegetables, which, in my opinion, are much better tasting than their paler cousins. 1. Peel the rutabagas and cut them into 2-inch chunks. Place them in a vegetable steamer over simmering, salted water and steam until they are tender, about 20 minutes. 2. Place the rutabagas in a food processor with the half and half, sugar, butter, cinnamon if you’re using it, and salt and pepper. Puree the rutabagas, adding a little more half-and-half if necessary. 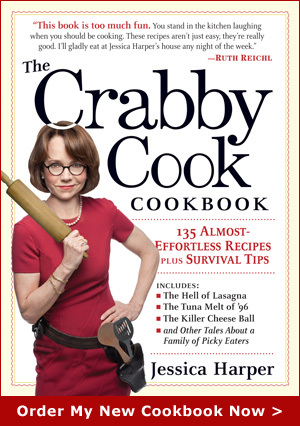 (The rutabagas don’t need to be perfectly smooth; a little bit of chunkiness is fine.) Serve hot. This entry was posted on Sunday, December 5th, 2010 at 8:11 pm	and is filed under Beside Myself. You can follow any responses to this entry through the RSS 2.0 feed. You can leave a response, or trackback from your own site. swedish cousins-i knew a swedish guy in the wsu music department (known as hillside high in those days to all the regulars) who was a brilliant but somewhat cantankerous pianist with a mordant sense of humor named dennis, who was the only pianist i ever met who actually played walter piston’s piano music!!!! he was from the land of swedes in kansas, lindsborg, of which it is said that ancient swedes knew of only two places in the new world-new york and lindsborg. ha. so anyways, one time dennis amazed everybody by sitting down to play, when all of a sudden, there was some disturbance, dennis looked out at us, went back behind the curtain to investigate, the curtain opened to reveal a splendid birthday cake all aglow with candles, with other student pianists standing around. dennis who by this time had everybody’s complete attention, went to the mike and said quietly, “we need somebody with a little hot air up here to blow these candles out”. end quote. it was his teacher’s birthday.